Set up, schedule and monitor your internal audits to assure you are in control. 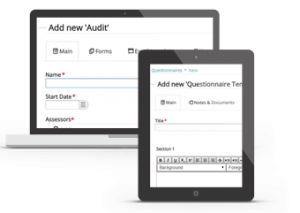 Manage your internal audits. They are scheduled to start automatically, people are invited and you have your dashboard to monitor the status. The audits create a full audit trial including evidence collection securely stored in the built in Document management system. It has never been easier to built your own web based audits and make them available to your team members, be it local or across the globe. Team members just receive an email with a link to the audit that is available for them. Easy to fill out, efficient and all data collected for you to swiftly report! Assessments are easily created and can be reused over and over again. The audit trail helps us to see not only a static picture but a dynamic view of our risk and control. The control audits give us an ongoing view on where we can improve to prevent risk from happening or to minimize the damages. We can take samples and evaluate them too! Monitoring the audit status saves us a lot of work and effort. Our review cycles are more efficient and our accountant loves it even though it cuts back on their bill.